[gallery size="medium" ids="1061,1062,1063,1064,1065,1066,1067,1068,1069"] 39,000 SF OUTDOOR AMENITY DECK WITH SPECTACULAR VIEWS DEBUTS AT VANTAGE IN DOWNTOWN JERSEY CITY Vantage, the upscale 45-story rental building in downtown Jersey City, has debuted an expansive 39,000 square-foot outdoor deck complete with a full offering of five-star amenities. Located on the 6th floor, the recreation and social center provides one of the most comprehensive amenity packages in Jersey City’s rental market, featuring a zero entry swimming pool, sundeck, poolside cabanas, multiple lounges, multi-purpose Great Lawn, private barbeque areas with seating, outdoor children’s play areas and full-court basketball court – all with the Statue of Liberty, Liberty State Park and New York City skyline as the backdrop. The resort-inspired outdoor facilities are joined on the 6th floor by a cyber café, state-of-the-art health club, children’s playroom, business center, conference room, screening room and dining area to provide residents a central hub where they can enjoy an activity-rich lifestyle. “The unique waterfront location of Vantage provided us an opportunity to create an amenity package unlike any found in the marketplace,” says Brian Fisher, President of Fisher Development Associates, developer of Vantage. 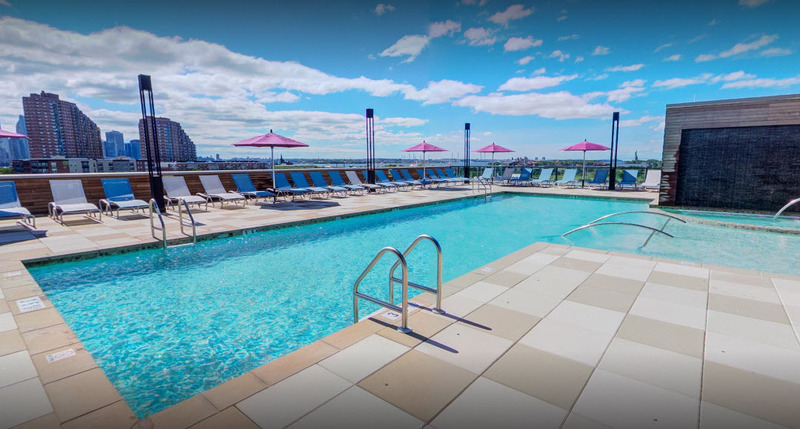 “We accomplished that goal with an outdoor deck that’s not only fully-equipped with the kind of amenities today’s renters want, but has also been designed to take advantage of our one-of-a-kind, uninterrupted Manhattan and New York Harbor views. There’s truly something to do for everyone, whether it’s relaxing and absorbing the ambiance in the pool or sundeck or participating in an outdoor activity on the Great Lawn or basketball court.” Topping off the building’s complete amenity offering is the 45th floor Vantage Point Sky Lounge, a social space with incomparable views. Vantage also offers hotel-like resident services, including a 24-hour concierge in its soaring two-story lobby. Vantage features luxury studio, one-and two-bedroom homes, priced from the low-$2,000s and available with immediate occupancy. Designed by S9 Architecture, apartments at Vantage boast floor-to-ceiling glass windows to bath homes in natural light and maximize its incredible location. Residences range from 550 to 1,300 square feet of living space and provide designer interior features, including nine-foot ceiling heights, kitchens with wooden cabinetry and quartz countertops, master baths with double sinks and showers with glass enclosures, an abundance of closet space, wood flooring, recessed LED lighting, in-home washer and dryer units and cutting-edge energy-efficient systems. Ideally located at 33 Park View Ave in the Liberty Harbor North neighborhood, Vantage lies just steps away from the vibrant dining/nightlife scene on Newark Avenue, while Manhattan is just minutes away via the Grove Street and Exchange Place PATH stations and New York Waterway ferry service. Park View Academy, an innovative daycare facility, has also signed a lease to open a 4,600 square foot facility in Vantage’s ground floor retail space. Brewshot Café, a one-of-a-kind coffee shop and restaurant, will occupy 815 square-feet of ground floor retail space at the waterfront building. “Jersey City has evolved into a vibrant and highly-desirable destination for not only local residents, but also renters from New York City who want a modern and amenity-rich living environment that’s complemented by a dynamic urban dining, nightlife and entertainment setting,” adds Adrienne Albert, CEO of The Marketing Director, the exclusive marketing and leasing agent for Vantage. “Vantage delivers all this and more in a striking glass-tower building with world-class amenities, a socially-infused resident environment and convenient location near transportation and renowned leisure time activities.” Fisher Development Associates has achieved LEED Certification from the US Green Building Council for Vantage. For additional information on Vantage, please visit www.VantageJC.com or call 201-333-1222. The building’s leasing and model center is open daily.